Antimicrobial resistance (AMR) is the ability of microbes like bacteria, viruses and parasites to evade treatment by antibiotics and other drugs. This is an increasing threat to global health as new resistance mechanisms emerge and spread across the world. Microbial life has long captured the interest of many artists. So what can artists contribute to the interdisciplinary approach required to both tackle antimicrobial resistance, and increase public awareness of this important issue? Join us on Tuesday 1st September 4pm to find out more. LifeSpace invites you to a family-friendly drop-in craft session on Saturday 4 July from 2 to 4pm. Make pompoms, decorate your own badge, try out the patterns for knitting microbes. Children welcome. Visitors will also be able to visit the ongoing Transmissions exhibition. Transmissions: Exploring the Microbial World is an exhibition that explores the microbial world and the implications of human co-existence with microbial life. The exhibition features work by artists who have collaborated with scientists to consider representations of microbial life, the global impact of microbial diseases and the evolution of antimicrobial resistance. Join us for the Preview of our new exhibition Transmissions: Exploring the Microbial World on Thursday 11 June from 5pm. Exhibition tour starts at 5pm. LifeSpace invites you to a free workshop with Gina Czarnecki as part of the Material Concerns exhibition. Palaces is a magical sculpture by artist Gina Czarnecki created using donations of milk teeth from the public. The Palace will continue to grow over time like a cluster of stalagmites or coral, to form a fantastical palace-like structure made of thousands of milk teeth. On Saturday 30th May, Gina Czarnecki will be adding teeth to the sculpture. If you would you like to donate your child’s milk teeth to build a stalagmite crystal sculpture, call in to LifeSpace between 11am – 2pm or pop them in the special collection box. Should living consenting adults be able to donate their own body parts to art? Janice Aitken, Philip Coates, Gina Czarnecki, Alan Fairlamb, Paul Felts, Morgan Petrie, Margaret Smith. Chaired by Sarah Cook. This debate is part of Material Concerns - an exhibition that explores consent in donation and use of human tissue in life, art and scientific research. In 2010, artist Gina Czarnecki initiated a programme of debates exploring issues around permission and consent, donation and participation, and art and ethics. This stemmed from her series of work called Wasted, exploring the life-giving potential of 'discarded' body parts and their relationship to myth. Palaces, a sculpture from the Wasted series, is currently on display in LifeSpace as part of the ongoing Material Concerns exhibition. The debate seeks to continue discussions about the ethics of ‘bio-art’ and we welcome participation from scientists and artists from across the University. Gina Czarnecki, David Connearn, Carolee Schneemann, Verena Friedrich and Alec Finlay alongside current research and historical artefacts from the University of Dundee. An art exhibition that explores consent in donation and use of human tissue in life, art and scientific research. 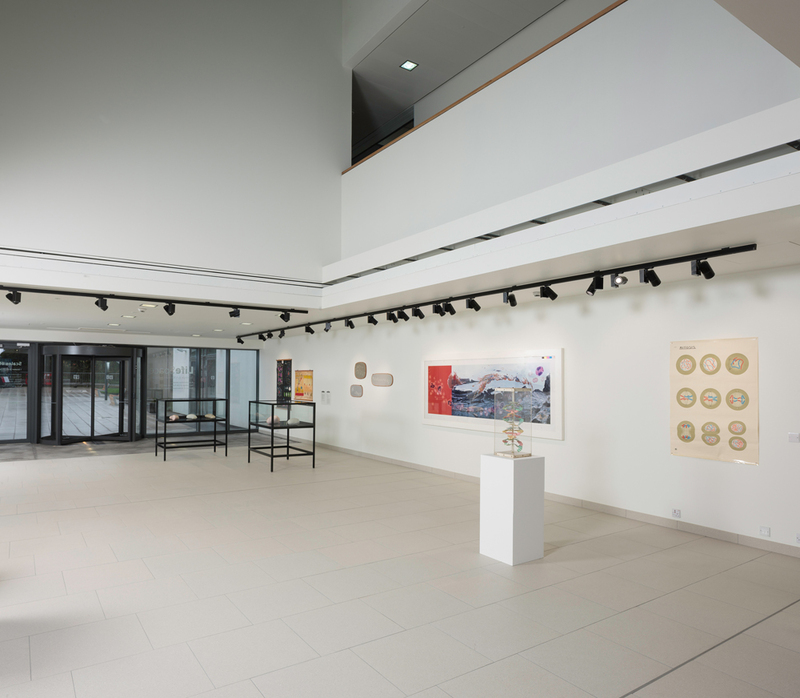 Including work by Gina Czarnecki, David Connearn, Carolee Schneemann, Verena Friedrich and Alec Finlay alongside current research and historical artefacts from the University of Dundee. For Dundee Science Festival and College of Life Sciences Open Doors Day, artist Tabitha Moses, scientist Prof. Irwin McLean and curator Dr. Sarah Cook spoke about their work in the context of the exhibition Scales of Life. Tabitha Moses spoke about her series of works Threshhold (The Sublime Skin) which featured in Scales of Life.